A favorite non-surgical treatment at the Toronto Beauty Clinic because the results are instant, the process is fast and safe. The filler contains hyaluronic acid gel ingredients such as those in the body. Injectable dermal fillers are used to treat the entire face creating a more youthful look. Immediate results can be seen and can last up to 1 year. Toronto Beauty Clinic always prioritizes the best care and is suitable for each client. What Dermal Filler Can Do? Fillers or filling of face volume can be used to correct and fill parts of the face, such as smile lines, tear lines, and to form chin, cheeks and nose, so that users can get a face that looks younger, chin that looks more sharp so the face looks oval, and the nose is more pointed. Fillers work under the skin to improve the elasticity of the sagging skin, unlike old techniques that tend to only tighten and flatten the skin of the face. This filler consists of several kinds including hyaluronic acid which can be used for limited areas such as the right or left corner, to fill the lips, and fill the basin under the eyes. Besides that it can contain bovine collagen, autologous fat obtained by lifting a little fat from one body, and so on. The skin is generally comprised of 3 major layers, the epidermis, dermis and subcutaneous. 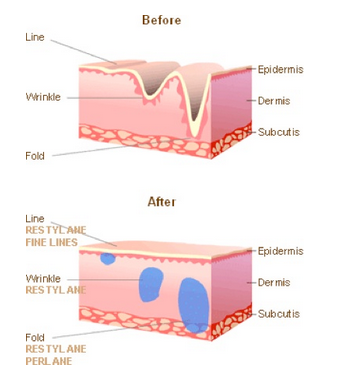 The epidermis is the outside layer containing skin cells that are constantly renewed. The middle layer is the dermis, holding both collagen and elastin. Collagen provides support to the skin while elastin provides strength and flexibility. Finally, the deepest layer, the subcutaneous, is under the dermis. This layer supports the two above it. HA is found within all layers of the skin, holding moisture and keeping the skin hydrated. In younger skin, cells are renewed very quickly, but this process slows down significantly as the body ages. By slowing down, the skin has less HA, collagen and elastin to support it causing the skin to thin. Combined with external elements such as sun exposure, diet, stress etc. the skin loses volume, sags and develops lines and wrinkles. Repetitive movement as well as gravity can also contribute to the look of aging skin. Dermal Fillers are used to temporarily add HA to the skin, restoring volume and filling in lines and wrinkles. The gels integrate naturally into the tissue and allow vital nutrients such as oxygen and hormones to continue to pass through the skin. After time, the HA will be naturally broken down and absorbed by the body. What To Know Before Get Injected? Before a treatment makeup and all other cosmetics should be removed to ensure the skin is clean. This can be done using an astringent or facial cleansing lotion. Using cold water will ensure that pores are not dilated. It is strongly advised to not take any anti-inflammatory drugs (e.g. Aspirin, Advil etc.) at least 3 days prior to treatment as they may increase swelling or bleeding at the injection site. It is also recommended to avoid alcohol, fish oil, ginkgo and omegas before treatment as well. For the first day or so after the treatment, try to keep the face relaxed by not making any highly expressive facial movements and avoiding any strenuous exercise. It is also important not be exposed to extreme heat (e.g. sauna, tanning bed, etc.) for a few days after the treatment as this may reduce the longevity of the results. Unless instructed to, do not massage the injected area. Makeup can be reapplied immediately after the treatment. Fillers enhance soft tissue augmentation. They are temporary gel based fillers made up of hyaluronic acid, naturally found in the body. It fills in the space between your skin providing volume, fullness, as well as retains water. Fillers are FDA-approved made up of a biodegradable, non-animal stabilized hyaluronic acid (NASHA). Fillers are very safe. The types of Fillers used in our office are hyaluronic acid Fillers. Our body simply breaks down the product within a few months. Although Fillers is not recommended for women pregnant or breastfeeding. WHICH FILLER PRODUCT IS RIGHT FOR ME? There are many types of Fillers on the market. They all do the same thing, however, depending on what area treated, some Fillers work better than others. During your consultation, our cosmetic injector will assess your face and then recommend the best type of Filler that will achieve the best results. Typically after a consultation, the procedure can take up to 40 minutes. The nice thing about fillers is it's pretty much instantaneously. Patients say they can see a difference right after a treatment. However, the skin needs to settle after Fillers and once any swelling subsides you can see the true results about a week later. Fillers are injected into the soft tissue with a needle. There is a local anesthetic inside the syringe which makes the treatment more comfortable. Our cosmetic injector likes to keep her patients extra comfortable. She applies a topical anesthetic before injecting as well as uses ice if necessary to add more numbing. (This also decreases the chance of bruising). Fillers can last between 6-12 months on average; results vary from person to person. To keep your Fillers lasting longer, it is recommended to maintain and come for "touch ups". The average person will do a Filler treatment 1-2 times a year. Most patients say they feel the initial injection, similar to a tiny pinch. It also depends on the person injecting you. Our Doctors and Nurses are well known for their light hands and patients love this, it makes the treatment a lot more comfortable. WHAT HAPPENS IF I DECIDE NOT TO CONTINUE WITH FILLERS? WILL I LOOK WORSE? No. Your face will never get worse if you stop using Fillers or when it wears off. Fillers do not stretch the skin either. If anything Fillers stops and slows the aging process. When you stop getting treatments, the “aging clock” resumes as normal, you will simply return to where you started. WHAT WILL I LOOK LIKE AFTER FILLER INJECTIONS? ARE THERE SIDE EFFECTS ASSOCIATED WITH FILLER TREATMENT? Minor complications can occur; they are generally easy to manage. Filler side effects can include some swelling, redness, bruising, and may have some mild discomfort. These are temporary and usually do not last long. After a Filler treatment a person can expect to resume to their normal routine. (Post care instructions of what to do and what not to do will be discussed).